Oman Air, the national carrier of the Sultanate of Oman, has celebrated the first anniversary of its service to Manchester Airport, after operating the route for just over a year. 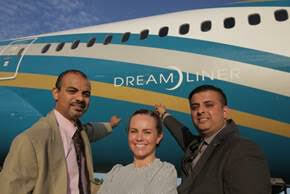 Following the success of the route, Oman Air started operating a Boeing 787 Dreamliner on the Manchester-Muscat service as of 1 July. The Dreamliner offers guests travelling from Manchester more space and equally more comfort, whilst onboard. Oman Air’s outstanding aircraft provides state of the art in-flight entertainment systems, individual seatback screens, audio and video on demand and live satellite TV. To mark the celebration, Oman Air UK management including Kelpesh Patel, Oman Air Interim Country Manager, and Feysal Nagi Oman Air District Sales Manager as well as key members of Manchester Airport held celebrations at the Oman Air gate. The festivities also marked Manchester Airport’s 80th anniversary. With the route operating for over a year, the Manchester service connects business and leisure travellers from the region to a myriad of destinations. This includes the Middle East, Africa, Asia and Indian subcontinent providing guests with more choice and easy connections, via the airline’s hub in Muscat.